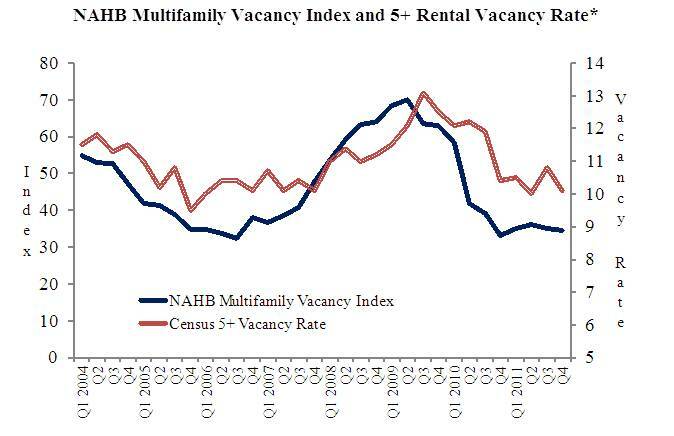 In the third quarter of 2012, NAHB’s Multifamily Vacancy Index (MVI) improved 3 points to 33, largely offsetting the previous quarter’s 5 point swing in the other direction. The MVI is a measure of property owners’ sentiment about vacancies in existing rental apartments, so lower numbers are better. After hitting a record high of 70 in the second quarter of 2009, the MVI began to improve consistently, until dropping to 33 at the end of 2010. For the past two years, the MVI has remained fairly stable in the low-to-mid 30s, which is as low as the vacancy index has ever been (the data go back to 2003). When conditions are changing, the MVI generally turns at least one quarter before the Census Bureau’s hard measure of rental vacancies. In 2009, improvement in the Census rate of vacancies in buildings with at least 5 apartments began one quarter after the MVI and was much more gradual. Since then, the 5+ rental vacancy rate has continued its gradual drift downward, and at 9.1 is now as low it’s been since 2000. With both the MVI and 5+ vacancy rate currently at healthy levels, there’s no strong reason to suspect either will change drastically in the near future. The MVI is one of two main sentiment indices produced from NAHB’s quarterly survey of multifamily developers, property owners, and managers; the other being the Multifamily Production Index (MPI). For more information, including a complete history for both indices and all of their components, see NAHB’s web page for the MPI & MVI. In the fourth quarter of 2011, NAHB’s Multifamily Vacancy Index (MVI) declined for a second consecutive quarter—from 35.1 to 34.7 The MVI is based on a quarterly survey of NAHB’s multifamily members, tracking their sentiment about the market for existing apartments on a scale from 0 to 100. A declining MVI is a positive change, as it indicates that sentiment is moving toward fewer vacancies. The MVI has remained essentially stable for roughly a year, hovering in a range between 33.3 and 36.1. 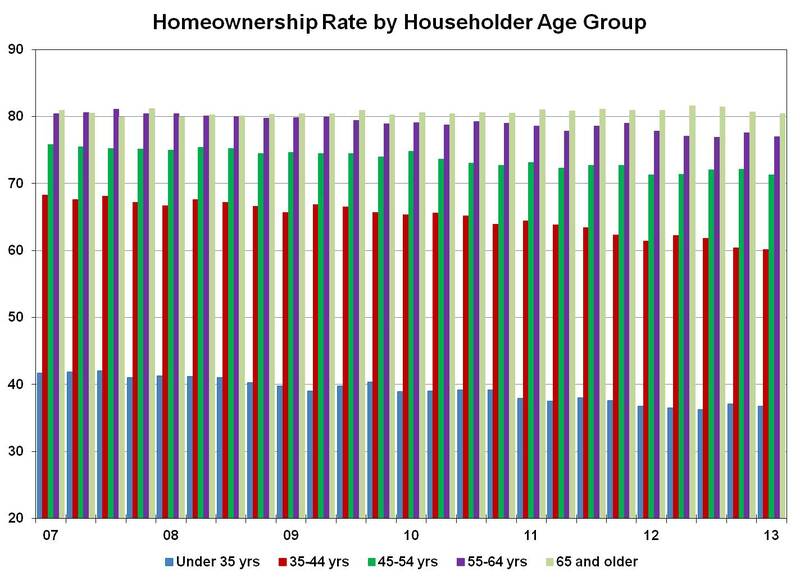 This followed an extended period during which the MVI remained above 40—often far above—from mid-2007 through mid-2010, roughly coinciding with the period when the Census Bureau’s vacancy rate in buildings with 5 or more apartments was above 11 percent (although the 11 percent-plus 5-plus vacancy rates didn’t begin until 2008). 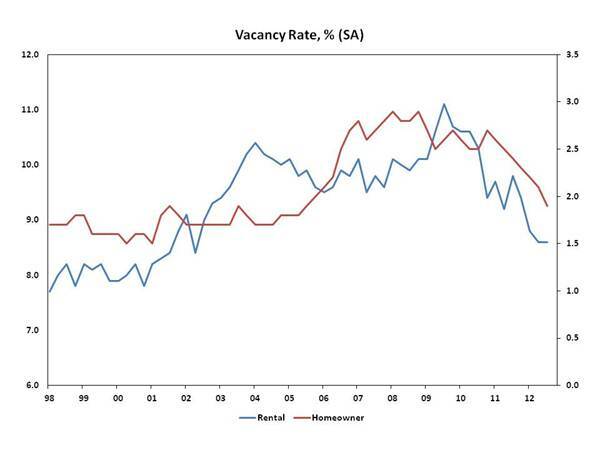 The Over its 9-year history, the MVI has generally foreshadowed movement in the Census 5-vacancy rate. 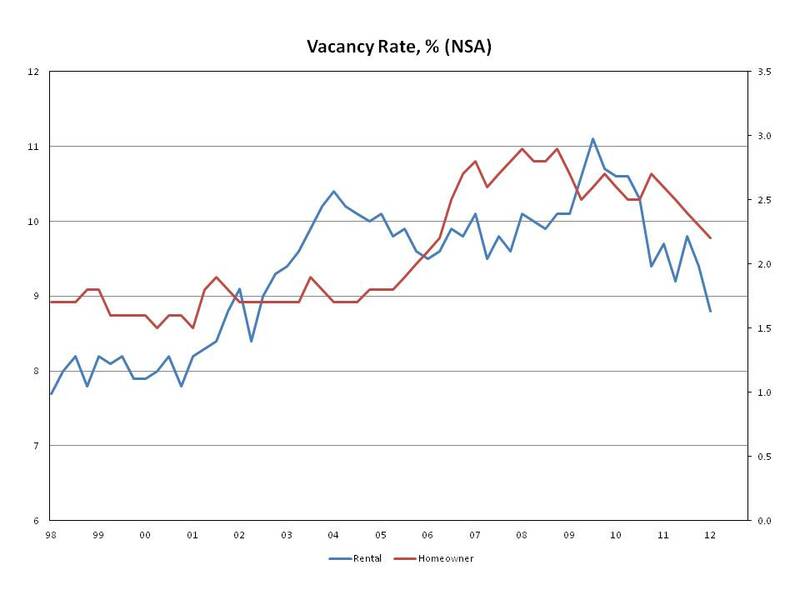 In the third quarter of 2011, for example, the 5-plus vacancy rate increased substantially—from 10.0 to 10.8 percent. The relative stability of the MVI during this period suggested that the third-quarter surge in the Census measure was likely to prove a temporary setback that would be reversed in the near future. This proved to be the case in the fourth quarter, as the Census 5-plus vacancy dropped back to 10.1 percent, essentially the same as it had been in the second quarter of the year. For more information, including historical tables for the MVI, see http://www.nahb.org/reference_list.aspx?sectionID=238. 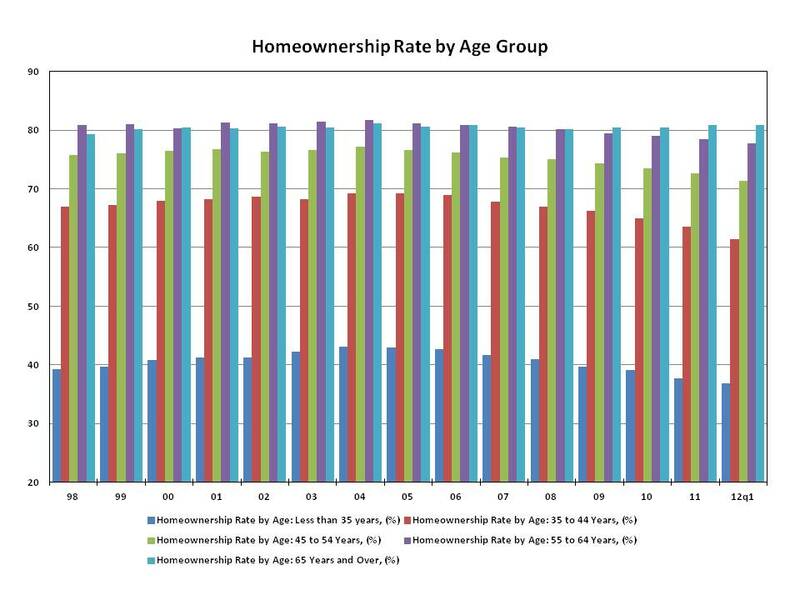 Tightest Housing Markets in the U.S.
A simple measure of tightness in a market for owner-occupied housing is the homeowner vacancy rate (number of homes for sale divided by the number either for sale or owner-occupied). Builders are often interested in markets that are tight by this measure, because it indicates prospective buyers will have difficulty finding a suitable home among the available existing units. Several federal government surveys provide homeowner vacancy rates, but the one with the greatest geographic detail by far is the Census Bureau’s American Community Survey (ACS). In a recent study, NAHB tabulated the most recent (2010) ACS this data for all metropolitan areas in the country. Overall, the tightest markets tend to be relatively small: Corvallis, Oregon (with a homeowner vacancy rate of 0.23%), Lebanon, Pennsylvania (0.49%), Billings, Montana (0.54%), San Angelo, Texas (0.61%), and Eau Claire, Wisconsin (also 0.61%). Because it may seem difficult to compare these areas to larger markets, NAHB also looked separately at the 27 metropolitan areas that have at least 500,000 owner-occupied homes. 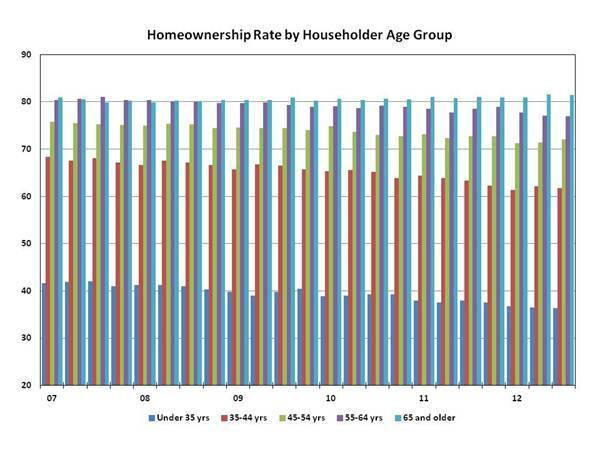 Homeowner vacancy rates for these 27 areas range from 1.43 percent to 4.65 percent. 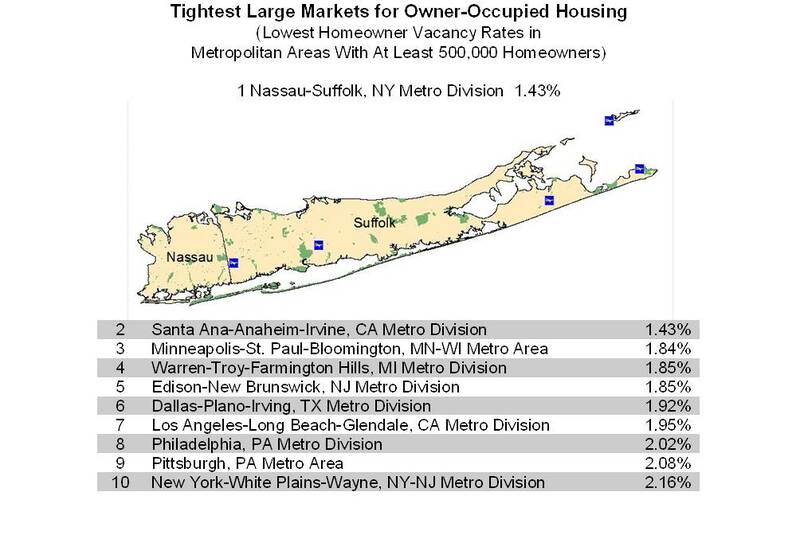 The ten tightest large markets are shown below. The two tightest large markets in 2010—Nassau-Suffolk, NY and Santa Ana-Anaheim-Irvine, CA—were also the two tightest large markets the last time NAHB looked at the ACS data in 2008. The NAHB study provides a rundown of the top-10 metros according to nine key measures, including: owner-occupied housing units; homeownership rate; home owner vacancy rate; share of single-family detached homes; value of homes owned; home owner incomes; growth in stock of single-family detached homes; and share of homes built recently. It also has a spreadsheet that shows how more than 350 other metro areas stack up in each category. Data from the Survey of Market Absorption (SOMA), produced by the Census Bureau and the Department of Housing and Urban Development, reveal limited weakness in the multifamily sector for the first half of 2011. 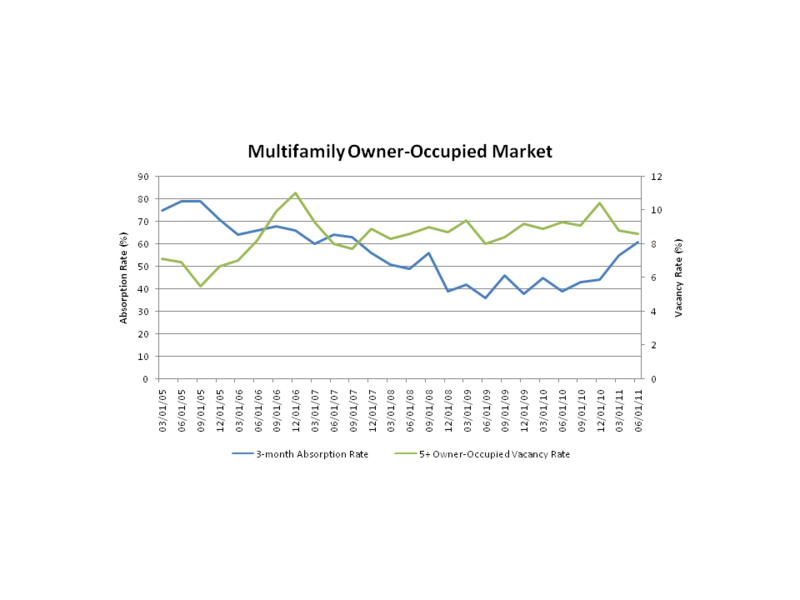 However, declining multifamily vacancy rates are a hopeful sign for future multifamily market expansion, which is consistent with improving responses reported in NAHB multifamily surveys. 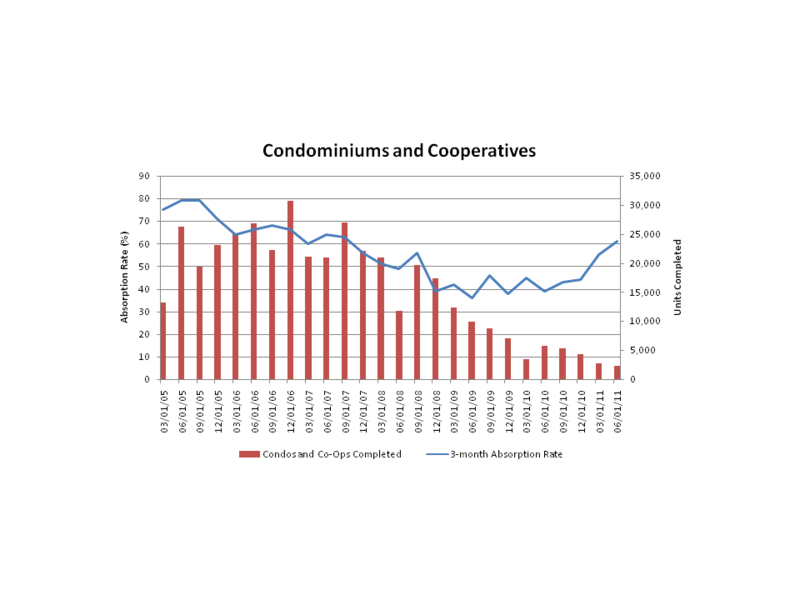 The SOMA tracks completions and market absorption (either units rented or units sold after construction of the property is complete) for multifamily rental and for-sale housing in 5+unit properties. Data released in December report absorptions for the third quarter of 2011 for properties completing construction in the second quarter of 2011. 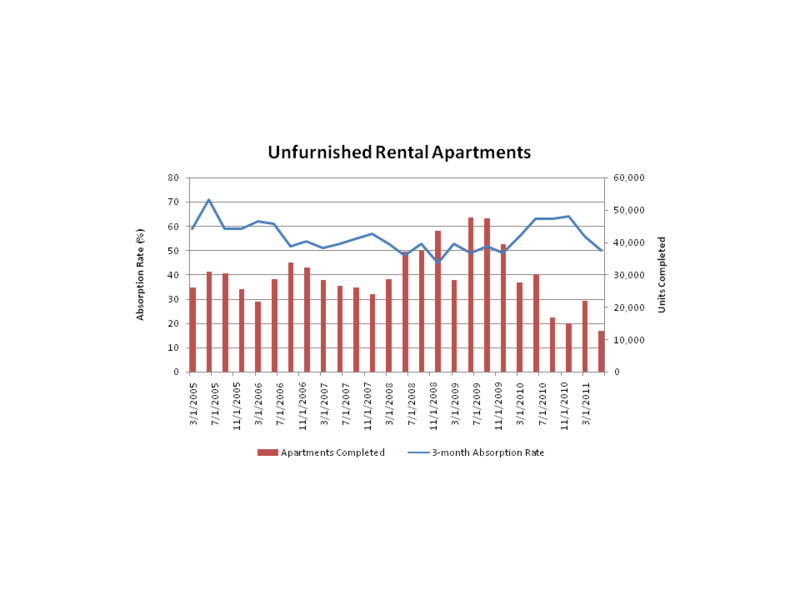 For unfurnished apartments, the SOMA data reveal some softness in the rental market for the first half of 2011. 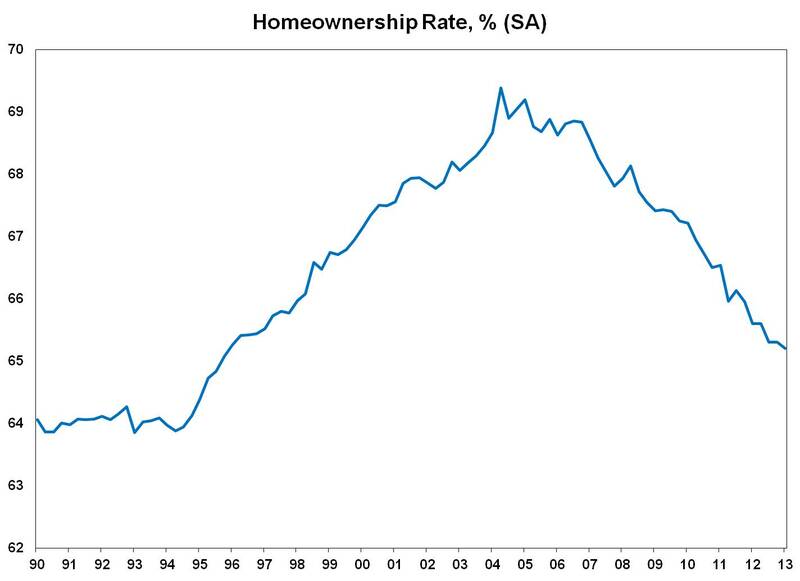 Rental apartments exhibited a fairly stable absorption rate of around 63% for most of 2010, but this rate declined to 56% in the first quarter of 2011 and 50% in the second quarter. However, this decline in the absorption rate of newly constructed rental apartments occurred during a period in which the rental vacancy rate was also, counterintuitively, falling. 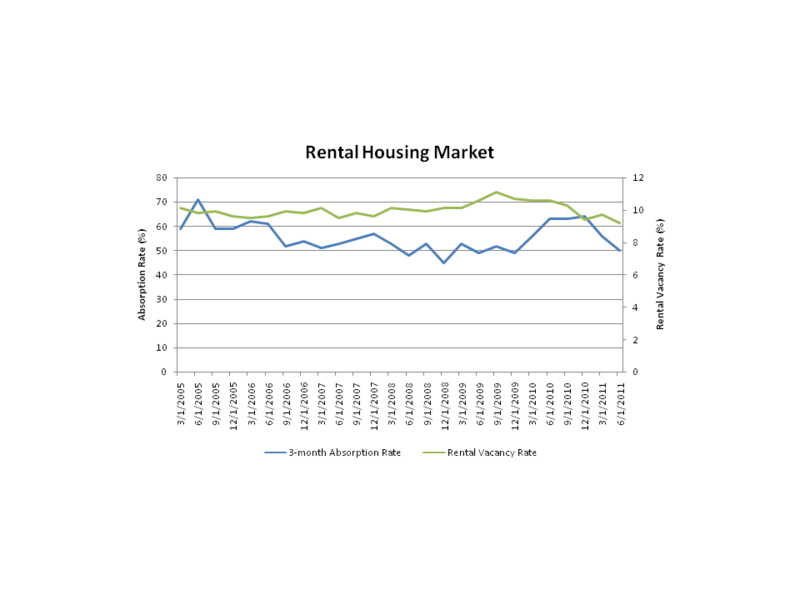 From the middle of 2010 until the middle of 2011, the rental vacancy rate fell from 10.6% to 9.2%. This fact suggests that the absorption rate for new apartments, as well as multifamily completions, will soon rise to meet increasing rental demand. As noted earlier, this is consistent with improving measures of multifamily market confidence, according to NAHB surveys. With respect to for-sale condominium and cooperative multifamily units, the story is also mixed. Completions are at record-lows, with 2nd quarter completions of for-sale multifamily units down more than 90% from levels reported five years ago. Nonetheless, for those units being placed in service, the absorption rate of 61% is at its highest level since the third quarter of 2007. 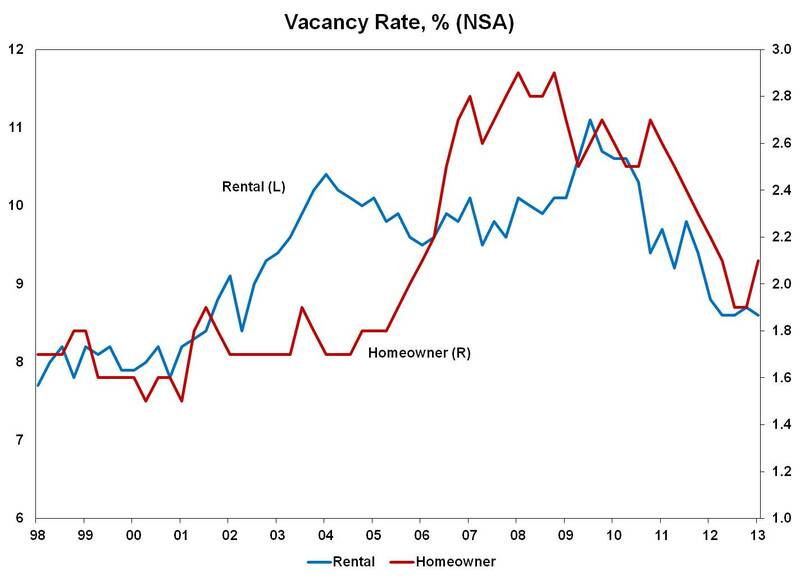 The owner-occupied vacancy rate for units in 5+ properties is also falling. Reaching a twenty-year high of 10.4% in the final quarter of 2010, the vacancy rate for owner-occupied multifamily units has since declined to 8.6% for the second quarter of 2011. These data, NAHB survey results, and significant amounts of pent-up housing demand that will emerge as rental demand first, suggest that construction of multifamily units will continue to grow in 2012.